In the previous entry, I was reflecting on the challenge of planning and delivering a university course in a truly collaboratively way. Well, my colleagues Magdalena Custodio and Lyndsay Buckingham and myself just presented an analysis of our first year of co-teaching together, in the framework of Instituto Franklin’s 4th International Conference on Bilingual Education in a Globalized World, that took place in Alcalá de Henares on November 16-18, 2018. On top of improving our co-taught coursework this year, we hope to build a more systematic research framework and investigate what makes co-teaching a positive factor in our classes, and to what extent exposure to this strategy can influence teacher trainees in their professional growth. On 20 October 2017 I delivered a tall about Thinking Routines and CLIL teaching at IV CIEB Conference. For easy reference, I have published the PowerPoint I used on Slideshare – please find it below. CLIL and EMI is not only big in Europe – it seems to be on the rise everywhere. This is what I found during an intense and exciting day at the School of Liberal Arts at King Monkut’s University of Technology, where I conducted a two-hour workshop on Scaffolding Techniques in CLIL/EMI, and most important, had a chance to meet with lecturers, Masters students and Secondary school teachers who are interested in EMI in Secondary and Tertiary education. The workshop was organized as a taster of the more intensive training I offer EMI lecturers at Universidad Autónoma de Madrid, and sought to engage participants in reflecting on the rationale of scaffolding learning when teaching through a foreign language, as well as applying a number of reception, transformation and production scaffolds suited to the learner’s language and subject competence. I am particularly grateful to the faculty at KMUTT, especially Richard Watson Todd and Ornkanya Yaoharee, for their invitation and for making the workshop possible. After 15 years working as a university lecturer teaching courses ranging from languages to Social Science, I feel it is a good moment to write down what I consider to be some of the most important principles of good teaching – at least the ones that have inspired my own teaching practice the most. There are a million ways of doing so, and your choices will depend on variables such as course materials, the profile of your students, or your personal style. By and large,I believe in capitalizing on students’ intrinsic motivation, and try to design class work that is engaging both personally and cognitively. I still remember a lecturer I had during my degree in Canada who taught my group a History of Science survey course. Well, she’d constantly say things like, “well, I could explain such and such a theory, but I guess it’s too complicated”. We all felt like telling her that at the same time another lecturer was asking us to read (and understand!) Kant’s Critique of Judgment in a week. And maybe we didn’t quite get there – but which of the two managed to motivate us more? Most students like to be challenged. And that’s understandable, because setting demanding yet realistic challenges is a sign of respect for students and their potential. Activation, of course, is not enough, if our students just end up cramming information into their short-term memories in order to eventually regurgitate it in the exam. Most courses will offer plenty of opportunities for thinking that goes beyond memorizing (sometimes called higher-order thinking) and it is your job to design activities that promote thinking in your class. What taxonomies such as Bloom or SOLO suggest is that lower order thinking skills are necessary but not sufficient, and that coursework and assessment should factor in higher order thinking, too. Describe the main features of economic policy A.
as it asks students not only to remember and understand (as the second question does), but also to apply, analyze and evaluate. In EFL teacher training courses and handbooks there is big fuss about reducing teacher talking time (TTT) and maximizing student talking time (STT). Of course, in language courses the point is essentially to get students to communicate. However, even in regular content teaching it turns out that students are usually more cognitively engaged when talking, negotiating, explaining, team-writing….in short, doing. Emphasis on collaborative class-room and flipped methodology goes in this line. I’ve written about constructive alignment before, as one of the theoretical frameworks on teaching that I have found most inspiring. Still, it still surprises me how easy it is to fail to evaluate students on the same skills that we ask them to develop in class. So what happens if most of the grade depends on a final exam that is based on memorization? 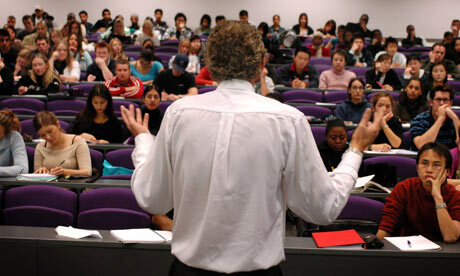 Well, most students (except perhaps the most academically oriented) will adjust to that evaluation choice and, perhaps, not give their best when it comes to attending our fantastically planned, student-focused lectures, or submitting other assignments that we have designed in order to improve our students’ thinking, communication or team-work skills. Why do so many uni lecturers keep sharing their own notes (a.k.a “apuntes” in Spanish) or endless Powerpoint presentations crammed with way too much information? Generally speaking, and when compared to published materials, notes tend to be poorly written and insufficiently referenced. Further, as I see it, they are a reflection of an obsolete model of education, in which the instructor is primarily the source of knowledge and the student the “recipient” thereof. Instead, I feel it is much better to expose the student to well-written texts in the discipline, whether it be teaching methodology handbooks, journal articles or research reports, and train students in critical reading of those genres. Maybe my bias here comes from my training as a language teacher, but I never quite bought the theory first, then practice sequence. In my experience, theory becomes most meaningful when it is taught in a real-life, practical context. This is the principle behind many teaching approaches such as problem-based or task-based learning. Further, I feel that students nowadays have a shorter attention span (or, if it’s the same as before, then they are worse actors) so introducing theory in a clearly defined practical context is the key to engaging them from the very beginning. As in other fields, convenient and immediate access to information using Internet has radically altered our roles in class. So, if we’re not here mainly to supply information, what is our main function? Well, in a student-focused scenario (see numbers 4 and 7, above), designing and managing meaningful classwork will take-up a lot of our time. But so will feedback, or the way we respond to student work and that should enable student progress on the targeted skills. In teaching terminology, we’re talking about capitalizing on formative assessment (for learning) v summative assessment (of learning). Generally, in recent years I have tried to take the extra step from teacher-focused feedback to more student centered forms of self- and peer-assessment. As I have described elsewhere in this blog, it turns out that this methodology, while not necessarily improving the performance of the stronger students, does result in a higher average performance for the class. Yes – really. You’re a university instructor, not a prisoner breaking rocks in some God-forsaken penitentiary.Have you ever thought about how lucky you are to be in the position of cognitively stimulating human beings at the prime of their lives? We all remember some or all of the good teachers we had in the past. They were engaging, inspiring and mostly fun. Well, who says it won´t be us who’ll be remembered by our students twenty years down the road? Este mes de septiembre comienza mi año cero sin Educación Infantil. En una de esas casualidades que te regala la vida, el paso de mi segundo hijo a primero de Educación Primaria ha coincidido con un cambio en mi asignación docente en virtud del cual ya no tendré clases con alumnos del Grado de Educación Infantil. Supongo que este cambio tiene sentido, ya que al fin y al cabo,mi especialidad es la didáctica del inglés y el AICLE/CLIL, pero creedme que echaré de menos la experiencia de entender cómo funciona el aprendizaje en edades tempranas. que no separa el aprendizaje artificialmente en asignaturas —o lo hace lo menos posible— ni pone como fin último un objetivo igual para todos. En esto, el aprendizaje basado en proyectos se parece mucho más al mundo real -profesional y personal- que el aprendizaje basado en temas o unidades. que parte de los intereses de los niños, de sus preguntas, y de sus ansias por investigar. que entiende el aprendizaje como algo social, que se realiza en equipo y comunidad, no como una competición en la que hay que quedar por encima de los demás. que involucra a los padres en el aprendizaje de los niños, y que, por qué no, también les educa para que respeten los ritmos y la autonomía de sus hijos. que respeta el grado de maduración del niño, sin encorsetarle en estándares diseñados para un niño abstracto que no existe. donde predominan los materiales únicos y especiales elaborados por la clase -la maestra, los niños y las familias- por encima de los materiales estándares e impersonales de las editoriales. que parte de la premisa de que no hay niños “normales”, sino que cada niño en el aula tiene sus necesidades, sus fortalezas y sus pequeños o grandes retos que superar. En definitiva, una educación respetuosa con la naturaleza del aprendizaje: personal social, rico en contexto, emocionante y divertido. Y que no debe terminar con el paso a Educación Primaria, sino que, al contrario, debe impregnar mucho más lo que sucede en las aulas de dicha etapa. Llegó septiembre, y con él aparecen a clase nuestros queridos alumnos con sus mochilas de ruedas llenas de ilusiones, esperanzas, algún miedo….y, sobre todo, de libros de texto costosamente forrados por sus sufridos padres, abuelos o tutores legales. 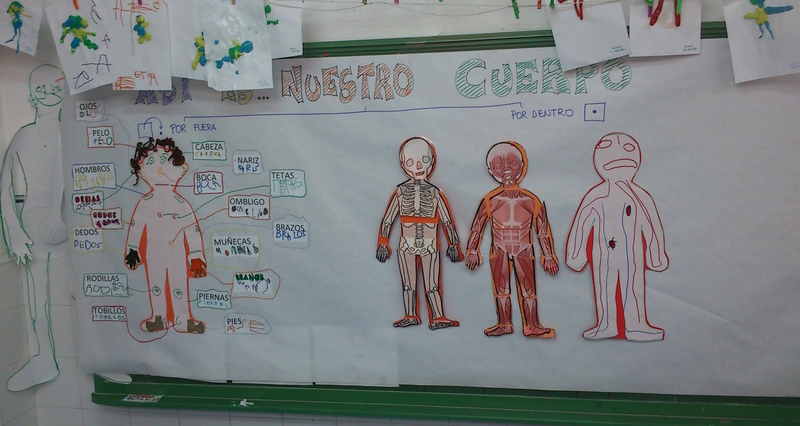 En este blog ya hemos denunciado los peligros de una cultura escolar basada en la sobreutilización de este recurso. Vamos a suponer ahora que, por X razones —que darían para otro artículo— nos vemos obligados a utilizarlos en nuestras clases. Lo que presento a continuación son tres sencillos principios, de aplicación casi universal, que nos pueden ayudar a sacar el máximo partido a los libros mientras que reducimos sus daños colaterales. Están inspirados en mis años de experiencia como profesor de inglés, pero, también, de mi observación de muchas clases de Lengua, “Cono” / Science e inglés. en esta clase vamos a partir de lo que sabe, piensa o puede predecir para conocer cosas nuevas. este proceso va a ser grupal y “personalizado” (cada grupo es diferente) y, si es posible, divertido. por lo tanto, “lo importante” de este proceso está fuera, y no dentro, del libro. ¿Alternativas? Infinitas. Diálogo con todo el grupo, apoyado (o no) por imágenes en la PDIo pantalla; lluvia de ideas, rutinas de pensamiento…Idealmente, que de las tareas de activación surja una duda o pregunta que pueda ser contestada por la lectura del libro. Las preguntas, imágenes o lecturas de activación al principio de las unidades son fácilmente reemplazables por otras obtenidas por nosotros, y que además pueden partir de la realidad cotidiana de los alumnos (cole, barrio, ciudad, región, etc.) ¿Por qué mirar una foto de un río genérico cuando podemos proyectar una del río que pasa cerca del cole? Las partes al final de las unidades también se prestan a ser sustituidas o, cuando menos, “tuneadas”: los típicos proyectos o experimentos de Ciencia Social / Natural, los esquemas o resúmenes, las preguntas de autoevaluación…Podemos incluso “copiarlas”, pero realizarlas con el libro cerrado, como una actividad aparte. Parece obvio, pero a veces nos olvidamos de que leer no es sinónimo de leer en voz alta. Sobre todo en grupos de niños más mayores (tercero en adelante) podemos pedir a los alumnos que lean en silencio o, mejor, en equipo, centrándose en el significado del texto y no en la forma oral. Lógicamente, también podemos apoyarnos en las grabaciones de los textos que vienen, sobre todo, en los métodos bilingües. Así trabajamos la comprensión auditiva y proporcionamos un modelo de pronunciación correcta. Como sugiere la didáctica de la lectura, es una buena idea proponer tareas de lectura antes de la misma. Pueden ser preguntas sencillas, p.e. de verdadero o falso, si o no, etc. Si el alumno escucha la grabación del tema, se pueden proponer actividades de respuesta física, (Total Physical Response), del estilo “levanta la mano cuando oigas el nombre de un animal”. Hacerlo proporciona una razón auténtica para leer (no solo que lo pida el profe) y, además, ayuda al niño a leer mejor, ya que, en la vida real, casi siempre leemos con una finalidad en mente (buscar un dato concreto, sacar una idea general, seguir una secuencia de instrucciones, etc.) y nuestros esquemas mentales adecuan la lectura a dicho objetivo. Otro tanto vale para las preguntas o actividades de comprensión que suelen seguir a los textos. Aquí es recomendable alternar diferentes formas de interacción: a veces podemos resolverlas juntos, otras preguntar individualmente, otras en parejas, grupos o equipos…Es importante tener en cuenta que algunos alumnos necesitan algo más de tiempo para procesar la información —incluso pedir ayuda a sus compañeros— así que, como regla general, resulta beneficioso que los alumnos tengan algo de tiempo para preparar sus respuestas. Se podrá pensar que este diseño alternativo consume demasiado tiempo. No necesariamente: ya que, de alguna manera, estamos integrando las preguntas o tareas de comprensión / refuerzo dentro de la propia lectura. Además, al estar promoviendo una lectura más significativa, es más probable que el alumno recuerde lo leído y lo integre en sus esquemas mentales, reduciendo el tiempo que necesitaremos para repasarlo. Obviamente, no estamos hablando de que cada página del libro se convierta en una aventura impredecible, pero si en alternar varios canales y formas de interacción para, por un lado, reducir la rutina y, por otro, ayudar a nuestros alumnos a ser mejores lectores. Creo que estos tres sencillos principios son válidos y aplicables en la mayoría de los contextos que nos podemos encontrar en Ed. Primaria y Secundaria. Al final, como en otros aspectos de la didáctica, se trata de aceptar, por fin, la idea básica de que es el alumno el que aprende, y no el profesor el que enseña o, peor aun, se limita a transmitir información. Y “negociar” en nuestras aulas con el hecho de que, aunque los alumnos de hoy tienen una relación con la información y el conocimiento muy diferente a la que tenían los de ayer, los libros de texto, por lo general, no han evolucionado al mismo ritmo. Eso, suponiendo que sean capaces de hacerlo. Espero que este texto os haya sugerido alguna idea o matiz que podáis incorporar a vuestras clases. Os agradezco cualquier aportación, sugerencia o crítica.